Product prices and availability are accurate as of 2019-03-28 17:12:09 EDT and are subject to change. Any price and availability information displayed on http://www.amazon.com/ at the time of purchase will apply to the purchase of this product. 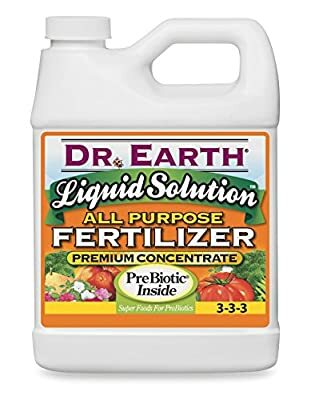 Dr. Earth Liquid Solution 3-3-3 32oz An all purpose organic fertilizer with chelated multi-minerals and growth enhancers for use on all plants including fruits and vegetables, trees, shrubs, vines, flowering ornamentals, container plants, hydroponics and turf. Designed to enhance plant growth and correct micronutrient deficiencies. Product will stimulate root growth, flowering and regrowth of stressed trees and vines, enhance seedling vigor, increase humus content in the soil, improve fruit set and reduce transplant shock.